Tuesday December 5th 1922 I was home all day. I have begun Christmas work. Hattie had The Shultz family and Fannie here for supper. Letter from Lydia. Wednesday December 6th 1922 I was fixing a dress in AM. Letters fro Mattie Stitt and Stella Webster. Hattie to Aid Society. Birdie at home. Thursday December 7th 1922 Rob & Birdie to Burlington at eleven oclock in The Ford car. The rest of us went to Fannies to a party. Did not get home till eight oclock. It rained so they had to stay in Burlington. I had letter from Lizzie Lindley with PO order from Emily for [$2000 or $20.00] Friday December 8th 1922 Very cold. Hattie ad me to town in Taxi. I did errands and came home same way. Down to Fannies in PM. The folks from Burlington at 5 oclock. Hattie & Cora at supper time. Saturday December 9th 1922 I worked in my part of the house all AM. I had my old cook stove taken out and heater put in. I did some washing in afternoon. Hattie to town down errands. Cold day. 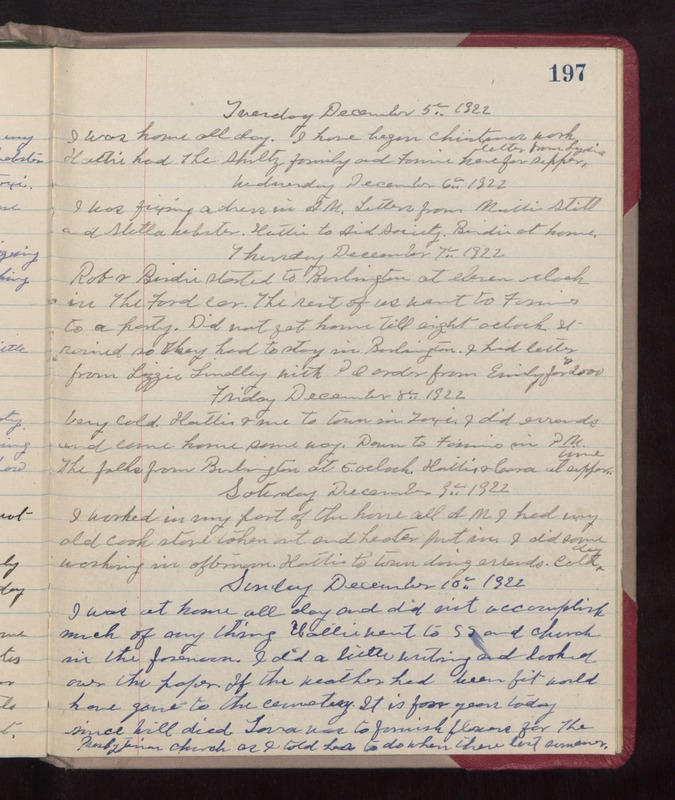 Sunday December 10th 1922 I was at home all day and did not accomplish much of any thing. I did a little writing and looked over the paper. if the weather had been fit would have gone to the cemetery. It is four years today since Will died. Laura was to furnish flowers for the Presbyterian church as I told her to do when there last summer.